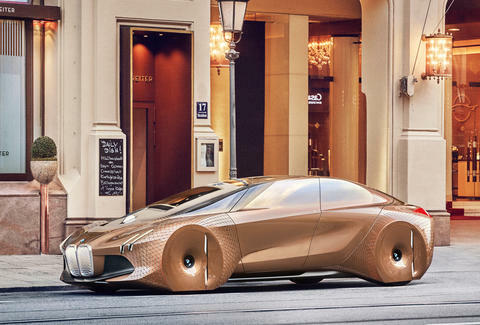 Back in March, BMW turned 100 years old, and to celebrate its centenary, it released the BMW Vision Next 100 concept, the designers' take on what cars will be like a century from today. 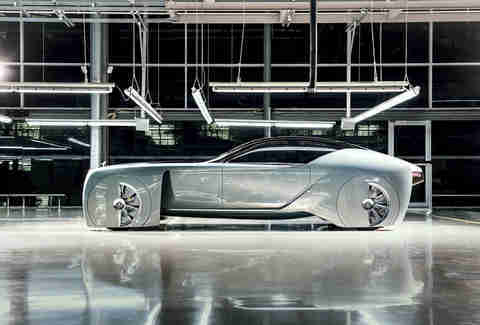 Now, the company just released two more concepts, the MINI and Rolls-Royce Vision Next 100. At first glance they're all a shock to the system (read: ugly as sin) -- but then again, today's cars would be too, compared to automobiles of the early 20th century. Take a closer look, though, and it's kinda hard to pry your eyes away. The Bimmer example you've probably seen, at least in passing, since it debuted back in March. It's unlike anything you've seen on the road, and yet, instantly recognizable as a BMW -- a testament to the branding strength of those iconic kidney grilles and the BMW signature Hofmeister kink (that line that arches upward at the back of the rear-side window). The copper color wasn't for a bling effect -- it's a symbol of energy efficiency. You'll notice the windows are painted, and per BMW, that results in less power used to regulate the interior temperature. The copper color comes into play because it's representative of the metal's excellent thermal conductivity. Also, note the vehicle on the far right of the photo. 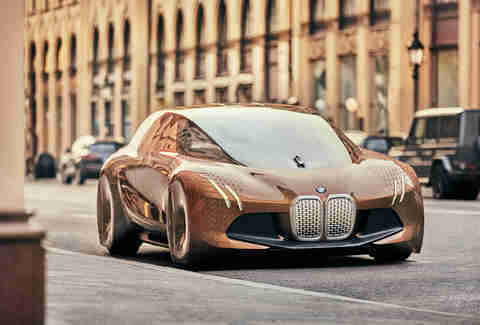 The futuristic BMW is facing forward, while a Mercedes G-wagen is pointed in the opposite direction. It's a subtle dig, both because the G-wagon looks mostly the same now as it did 40 years ago, and because BMW and Mercedes have a history of gently trolling one another. And I do mean cabin. There's a veritable couch, and no semblance of anything car-like -- did you really think that a century from now the wealthy would be schlepped around in anything other than an autonomous car? Also, note that colorful panel at the front -- that's a hologram display, including your own personal hologram angel-slash-concierge. If you're familiar with Rolls at all, you'll recognize her as the Spirit of Ecstasy. OK, here's where it gets a little weird(er). 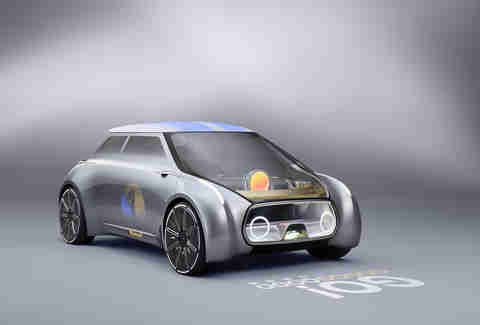 MINI's vision of the future is, as you might expect given the brand's current offerings, a wholly customizable experience. It's also translucent at times. The focus here is all on seamlessly fitting the car into your life, but encouragingly, it still has a steering wheel. Obviously, none of us will be around in a hundred years to see if MINI comes through on the promise, but if it does, there might be hope for the future of motoring after all. Aaron Miller is the Cars editor for Thrillist, and can be found on Twitter and Facebook. He likes that captivating Rolls-Royce more and more every time he looks at it.